Impeccably directed, superbly written and brilliantly acted, this is a terrifically entertaining thriller that gets everything right and confirms Ben Affleck as a major directing talent. Directed by Ben Affleck, Argo is based on a recently declassified true story (adapted from an article by Joshuah Bearman) and is set in 1979 during the height of the Iranian revolution, when protesters attacked the US Embassy and took 52 Americans hostage. However, six Americans (Tate Donovan, Scoot McNairy, Clea DuVall, Kerry Bishe, Rory Cochrane and Christopher Denham) manage to escape and go into hiding at the Canadian Embassy, under the care of the Canadian Ambassador (Victor Garber). 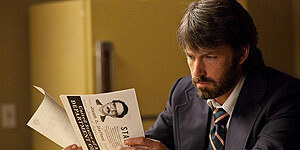 When CIA Chief O'Donnell (Bryan Cranston) asks his staff to brainstorm ideas for rescuing the hostages, Agent Tony Mendez (Ben Affleck) comes up with a plan that's so crazy, it just might work: cashing in on the Star Wars-inspired fad for fantasy Sci-Fi movies, he'll travel to Tehran and pose as the producer of a fake film, taking the hostages out under false passports as his location-scouting crew. However, first he'll need a convincing backstory, so he travels to Hollywood and cooks up a fake film with a real script (fantasy epic Argo) and a real producer (Alan Arkin), with the help of Oscar-winning make-up artist John Chambers (John Goodman). A heavily-bearded Affleck is terrific as Mendez, delivering an impressively quiet, unshowy performance that is prepared to fade into the background (much like, one assumes, the real Mendez), rather than play him as a gung-ho, take-charge, hostage-rescuing action hero type. The supporting performances are equally wonderful, particularly Goodman and Arkin (who make a delightful comic double act), while there's strong work from McNairy and DuVall as the hostages and Cranston is brilliant as O'Donnell; in fact, Affleck has filled even the bit parts with superb character actors (Zeljko Ivanek, Titus Welliver, Bob Gunton, Chris Messina etc) and ensures everyone gets a chance to shine. As a director, Affleck maintains a cracking pace throughout and strikes the perfect balance between humour (Chris Terrio's script is often very funny), gripping suspense and full-on thrills: the final act is nail-bitingly tense and pays off brilliantly. Essentially, Argo just gets everything right, from the casting, direction, editing and balance of tone to Rodrigo Prieto's stunning, 70s-looking cinematography, some commendably accurate production design work (a series of shots from the film matched with real-life stills plays over the end credits) and a fabulous score by Alexandre Desplat. Indeed, the film is almost certain to be nominated for a whole raft of Oscars, headed by nods for Best Picture, Best Actor and Best Director. By turns gripping, moving and laugh-out-loud funny, Argo is a hugely entertaining thriller that gets everything right, thanks to brilliant direction, a superb script and a host of terrific performances. Unmissable and one of the best films of the year.